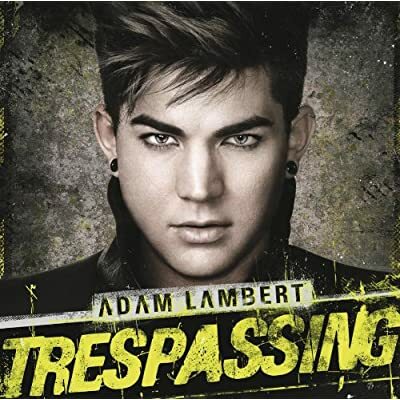 Trespassing – Adam kicks off the album with a whole load of attitude and aggression. Adam said earlier this year that he wanted this track to say ‘“f**k you, I’m fierce!” he definitely achieves this with the opening song. It’s very Queen-esq in it’s musical structure, especially the bass line, but the crazy vocal tricks and licks are 100% Adam Lambert. In terms of vocal range Lambert takes some beating, Muse’s Matt Bellamy is the only person who I think comes anywhere near to his falsetto range. Excellent anthemic opener – the electronic guitar at the end of the track is the perfect finish. Cuckoo – The first time I heard this track I felt it should have been a single, this could be Lambert’s personal track that speaks to his fans in the way that I think Lady Gaga is excellent at achieving, ‘I wanna lose my mind like a maniac…and we’ve gone Cuckoo, gonna party till they take us away’ I want to be there with Adam living this party! Vocally and production-wise it’s half a crazy 80′s vibe mixed with some pure pop moments. Shady (feat Nile Rodgers & Sam Sparro) – the funk and soul of this track oozes out of my speakers and takes over my head/shoulders/hips and toes – you can’t help but get into the track with it’s retro vibes, Michael Jackson would be proud. The extra soulful guest vocals add another layer to the track, it’s one of my favourites. Never Close Our Eyes – don’t get me wrong, this is still a good track but to me the record label have got all the single releases from Trespassing wrong. There are more exciting and progressive tracks on the album then this. However, I like the structure of this song, the way it builds up to the chorus is a testament to the skilled production on this album. Kickin’ In – this is the second Pharrell Williams track on the album (Trespassing being the first) but to me this is more familiar Williams territory, this is also rumoured to be one of Sauli Koskinen (Lambert’s boyfriend) favourite tracks. It’s got more of an urban/dance flavour to it. It definitely stands out as something different on the album, but doesn’t get onto my favourites list..perhaps because I feel it is lacking a good narrative to it lyrically. Naked Love – alright I’ll admit it I’ve been listening to this track on repeat for the last week! I just LOVE LOVE LOVE it – the lyrics, the pop sensibility tinged with a sprinkling of naughtiness. The ‘ooooh ooohh ooooh’ bits would be amazing to sing along to at a gig and it’s just a fun and flirty track, I love Adam’s vocal take on the lyrics, all the little sounds he makes throughout the track..it just makes me happy inside. Plus I’m sure a few of our readers have imagined Adam’s naked love from time to time! Pop That Lock – a song that was written to be released, I shall be honest I don’t know if it’s best suited to be an Adam Lambert single though, I can picture Katy Perry or Britney Spears recording a version of this for the club scene. The break-down part is interesting and some of the lengths of Adams notes as just wow- you wouldn’t catch Spears doing that! Not one of my favourite tracks though. Better Than I Know Myself – this served as a ‘nice’ single and I can see why the record company went for it, it’s a power-ballad which they probably thought was main-stream radio friendly. But again there are braver single choices and stronger songs on this LP. On the other hand if we didn’t have this as a single then we wouldn’t have got that brilliant music video in which ‘dark’ Adam stole my heart. I also liked that the visuals made me think about the lyrics in a different way – as in someone actually singing and talking to themselves about their different sides. The song makes stronger sense in the structure of the album as it’s a half way point between the light and darker tracks. Broken English – speaking of darker tracks, this album does tell two tales, the first half is pop/dance music and the lyrics are of a lighter natural, ‘English introduces us to the other side of the LP. The beat is of a slower tempo and their is a dub-step influence to the production. Lyrically it’s all about not being able to talk to someone, crossed wires and not being able to tell someone about the ‘little things.’ It’s different and I like it. The break-down section in the track is so haunting and gothic with Adam’s lyrics, it could almost be part of an Operatic performance. This I think is a definitely grower. Chokehold – after I’ve just mentioned getting a bit choked up with Underneath Adam has read my mind and written a song around the subject. This is a dark take on the subject, someone has got a hold and power over Adam that he can’t escape, he knows it might be wrong but he can’t resist the lure of this experience despite himself. Outlaws of Love – Adam takes it right down tempo-wise on this track, it’s a softer vocal from him with just a simple drum beat behind the track. I do not wish to assume this song is a commentary on the LGBT communities struggles in finding acceptance in the world but the lyrics could be read in that way and it was the way in which I interpreted the song. Runnin’ – a stronger drum beat greets us with the introduction of this track, again it feels like a very emotionally charged track from the sound of Adam’s vocals, I love the drum build up to the chorus, it’s a track which you could sing along to after even a couple of listens. Another potential live anthem, it would be breath-taking to see this track brought to life at a gig. Take Back – this track isn’t as hard-hitting as some of it’s companions, it’s still got that dark side to it though with a more rocky edge. To me it hasn’t got enough to distinguish it from just ‘fitting in’ on the LP. Nirvana – oooh I like this as a closing to the album, album endings are important to me as they should close off the story and the narrative built up throughout the tracks. Adam starts off being a trespasser in his own life and at the end is telling us that now he’s in a state of Nirvana – which is the freedom from suffering and pain into a transcendent state of mind. Adam sings of ‘flying away to a higher place’ ‘where the dreamers lay’. It’s a beautiful way to finish the album, highly ethereal sounding it demands your focus and attention from start to finish. Adam really tells his story through this album, it’s personal and emotional but also contains a sense of fun and naughtiness at the same time. This could be a hard balance to strike for some but Lambert and his team deserve credit for the structure and execution of this album, we are taken from lighter tracks like ‘Naked Love’ through the darker times of ‘Chokehold’ to a final state of ‘Nirvana’ without feeling like the process is rushed or forced, it just feels like a very natural process of discovery and learning. I truly hope he picks up some new fans with this album, he deserves it. Out May 15th in the US. If you have enjoyed reading this review then please share it through your social networks. 2 Responses to "Adam Lambert – “Tresspassing”: A “Popledge” Album Review"